Throughout the week, fourth grade students in Jeannine Ary’s music class performed Carnival of the Animals as puppet theater for other lower school classes. Carnival of the Animals is a humorous musical suite of fourteen movements by the French Romantic composer Camille Saint-Saëns. 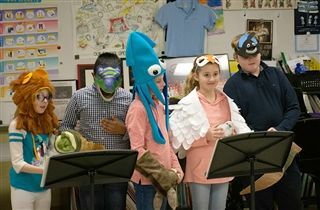 The fourth grade performances contained a variety of animal puppets, fun music, and animal sounds. The production helped lower school students prepare for the Louisville Orchestra‘s family concert in March.